A dominant player either in defence or midfield Roy Aitken was best associated as a player with Celtic FC where he would enjoy 672 appearances in an incredible 17 year career. His commanding presence on the field and powerful running with the ball won him the nickname of “the Bear” as the Parkhead support regularly sang “feed the bear” to encourage Roy to drive forward. He became team captain, taking over from the legendary Danny McGrain, and was a driving force behind the Celtic side which won the league and cup double in the club’s centenary season. With Celtic Roy would go on to win six Scottish League titles, five Scottish Cups and one Scottish League Cup. 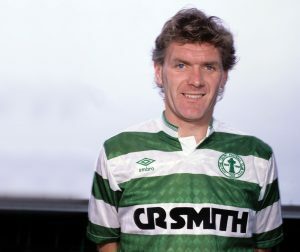 Roy left Celtic to join Newcastle United in 1990 and also had a brief spell at St Mirren before signing up with Aberdeen as player and assistant manager to WiIlie Miller. Capped 57 times for Scotland between 1979 and 1991 (with 27 of these as captain) he played at the 1986 and 1990 World Cups.